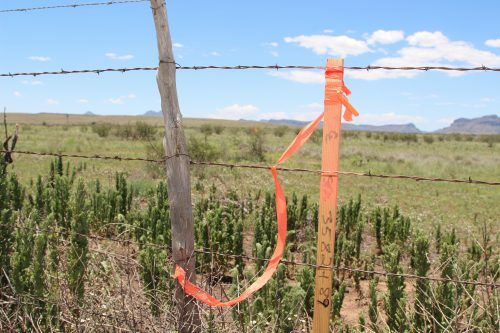 MARFA, Texas —Six landowners in west Texas have won a series of awards totaling in the millions of dollars against a company building a controversial natural gas pipeline. A seventh case went against a landowner. The landowners are part of a group of approximately 40 people or landholding entities that are contesting compensation offers from Trans-Pecos Pipeline, LLC, a subsidiary of Energy Transfer of Dallas. The pipeline has been designated by Texas state regulators as being in the public’s interest, specifically that this pipeline project meets the standard of “common carrier,” that it will transport, in this case natural gas, for any natural gas producer who has the money to pay for the pipeline service, without discrimination. With “common carrier” status comes the notion that a given project is in the public interest and with that comes legal power of eminent domain, the power to seize private land. Companies that exercise that power are obligated to pay compensation to affected landowners in recognition, in this instance, of the change to that land that construction of a 143-mile pipeline implies. The Trans-Pecos Pipeline would ferry natural gas from the U.S. to the Rio Grande and into Mexico. The project comes after Mexico Federal Electricity Commission awarded a $770-million contract to Energy Transfer to build the pipeline to start in the oil and gas rich Permian Basin of Texas and end in the middle of the Rio Grande, where the natural gas would join up with a series of Mexican pipelines. Mexico says it needs the natural gas for planned electricity generation plants and to reduce the oil used in some of the country’s existing power generation. The project has been approved by the U.S. Federal Energy Regulation Commission. Project supporters say that local governments will earn millions in property taxes paid by the pipeline company and that the state’s natural gas producers will gain access to a new market during a natural gas glut. But six landowners have rejected what they believe are offers that fail to adequately compensate them for the expected negative environmental impact that construction of a natural gas pipeline using 42″ diameter piping will have on working ranch land and other land holdings. None interviewed for this story suggest the project can or will be stopped entirely. Despite that belief, for them, there’s unfinished business in the ranchlands of West Texas. Jeanne Simpson is one of the six. “I received this $18,000 offer and was told I had a week to accept it,” she said as we rode in her truck across the Barreno Ranch, where generations of her family have lived since the 1880’s. She said that ultimatum came after negotiations stalled with Energy Transfer/Trans Pecos Pipeline, LLC. She said she thought she was negotiating in good faith. She explained that negotiations ended after she told the company that she wanted to discuss the details of that part of the route that would cut through her land. She said after making that request, she received a compensation ultimatum that she, and later a special commission appointed by a Texas judge, ruled was far too low. “That tree is a hundred years old, at least,” she said pointing to a solitary hackberry tree flanked by a boundless tableau of high desert color and jagged mountains. When the local power company put a power line across the ranch, it adjusted the route to preserve the tree. 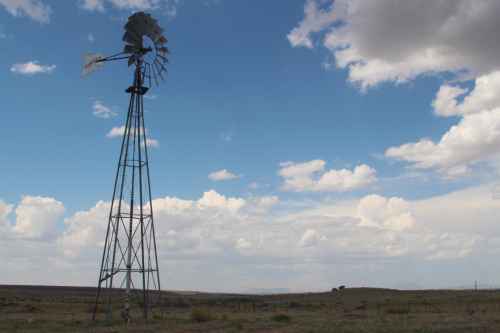 The natural gas pipeline route cuts through this windswept slice of the borderlands, through some of the last pristine, legacy working ranch lands in the United States. “You’re going to have heavy trucks hauling heavy pipe back and forth,” Simpson said, the clear implication being that heavy equipment poses a potential threat to erosion of topsoil in a region that historically has struggled to preserve the integrity of the land. The project is cloaked in an aura of inevitability, so the focus now is on compensation. For landowners, it’s a critical issue because pipeline construction may damage a famously fragile ecosystem. Simpson and five other landowners rejected the company’s compensation offers. So Energy Transfer/Trans Pecos Pipeline LLC took the landowners before a special commission in early June in the west Texas town of Marfa. The commission awarded six landowners a total of around 30 times what the company had offered. In her case, Simpson offer of $18,000 was amended and raised by the commissioners to close to $700-thousand. Another landowner, offered $16,000, was awarded close to $.5 million dollars. Another was offered $33,000 and received close to $1 million. “My immediate goal is to receive fair compensation for the damage that’s going to be done to my ranch,” explained Simpson. Compensation judgements against the pipeline company come as a media campaign is launched opposing the pipeline, backed by high profile names in Hollywood such as Owen Wilson, Tommy Lee Jones and film director Wes Anderson. In an open letter published in the Dallas Morning News, close to 100 people from celebrity to common citizen appeal to Energy Transfer to reroute the project to largely uncontested land. Since that letter was published, approximately 500 others have signed an online version the letter, compiled by the Big Bend Conservation Alliance, a group that has lead opposition to a project many people fear in the Big Bend of Texas. This appeal’s happening as the state considers tightening eminent domain law to benefit landowners, but formal legislation to do that has not been been proposed. In 2011, Austin attorney Bill Christian won a rare victory for a landowner opposing another pipeline. But in an example of the energy industry’s power in Texas, the company was still allowed to build while its appeals went through the courts. That case will be heard for the second time by the Supreme Court of Texas this Fall. As for Trans-Pecos Pipeline case, he believes the pipeline will be built. “In terms of the ultimate result of having a pipeline running across their land, that’s still going to happen,” Christian explained. And as for compensation, he suggests pipeline companies have pockets deep enough to pay for sustained legal action against resistant landowners. “In the grand scheme of what this project’s going to cost, it’s still kind of a drop in the bucket,” he said. Back at Barreno Ranch, rain is falling and hailstones are dancing on a metal shed. Light and sky paint a moving mosaic. The water is welcome in a land where drought ruins lives. Jeanne Simpson said she often thinks of the generations of her family who’ve lived here and endured nature’s challenges in a rugged, hauntingly beautiful landscape. “I owe their memory some courage,” said Simpson in reference to her legal battle over compensation. In a statement, Energy Transfer said it will appeal the monetary judgements against it if necessary. The landowners’ lawyer, Zach Brady of Lubbock, Texas, said these cases are likely to go to jury trial, and that that landowners are ready. He said they “look forward to the opportunity” to make their cases in court. This entry was posted in KRTS News and tagged Courts, Economy, eminent domain, Energy, Energy Transfer, Fronteras Desk, Industry, Landowner Rights, Law, marfa, Natural Gas, Oil and Gas, Presidio County, Ranching, Trans Pecos Pipeline. Bookmark the permalink.